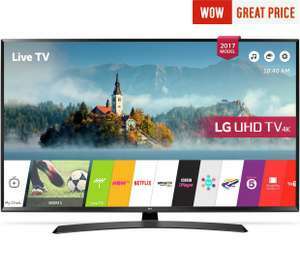 Great 49inch 4K TV at a decent price. Also available in 43inch for £349. So, just the model number. Okay, so the difference between them is that the UJ635 has ULTRA luminance. That's the 43 inch. 49 inch is £499. Says Freesat HD in the Argos spec. Anyone know if it's RGBW? Says Freesat HD in the Argos spec.Anyone know if it's RGBW? It is. I have the 55 inch version. Picture is still great and keep in mind you save about 500 quid vs rgb. There is no true 10 bit panels at this price point. Stand looks better than the legs. Just bought this from John Lewis. I though you meant that the stand is ugly . It’s a nice TV for the price shame it’s not real 4K but my parents probably won’t even notice. Deal posting newbie! This is SyedMusaGilani first deal post. Help out by leaving a posting tip or just to show your appreciation for their contribution.